Much like I never really knew what chickpeas were, I was pretty much in the dark as to what Chicken Cordon Bleu was, too. It always sounds like something very difficult and very French, so I never really gave it much thought. It took me discovering this recipe to realize what it actually is. 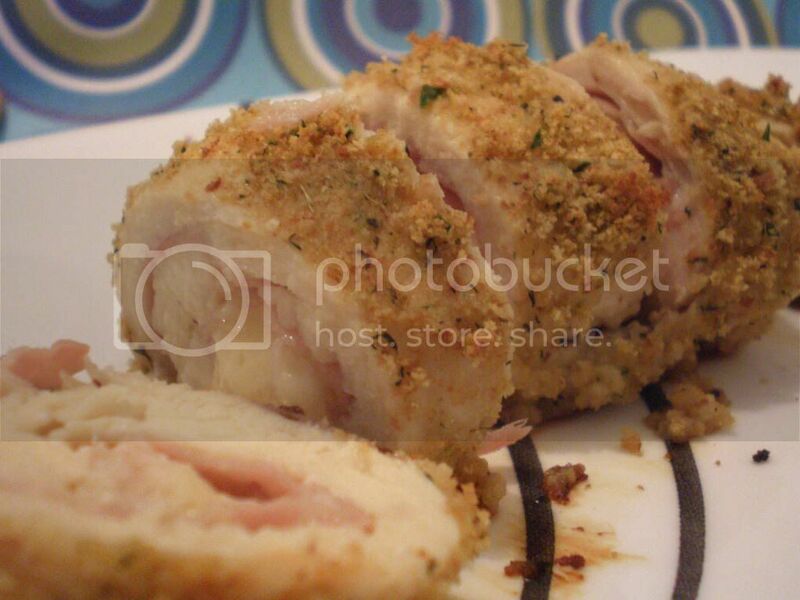 According to Wiktionary.com (don't ask me where these weird dictionary/encyclopedias pop up from) Chicken Cordon Bleu is "thin slices of chicken pressed together and breaded, with a filling of cheese and a ham slice inside, and baked or sauteed." Well, lo and behold, while trying to use up some prosciutto, I discovered Herbed Chicken Rolls from Cooking Light. 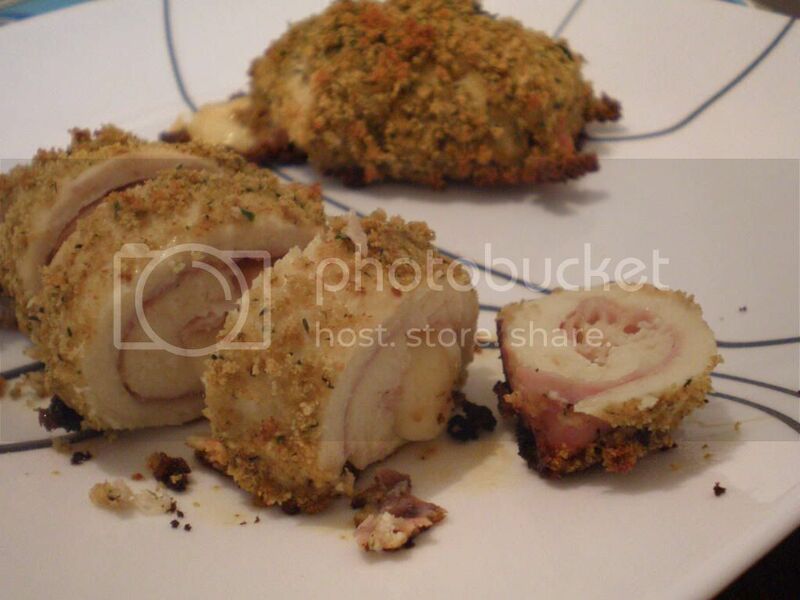 And of course, I had no idea it was pretty much just Chicken Cordon Bleu. Either way, I found a new recipe that was fairly easy to make and turned out pretty good. Combine first 5 ingredients in food processor, and process until crumbs are fine; place crumbs in a shallow dish, and set aside. Combine egg whites and water in a shallow bowl; stir well, and set aside. Place each chicken breast half between 2 sheets of heavy-duty plastic wrap, and flatten to 1/4-inch thickness using a meat mallet or rolling pin. Top each with a slice of prosciutto and a half piece of cheese. Roll up jelly-roll fashion. Tuck in sides; secure each roll with wooden picks. 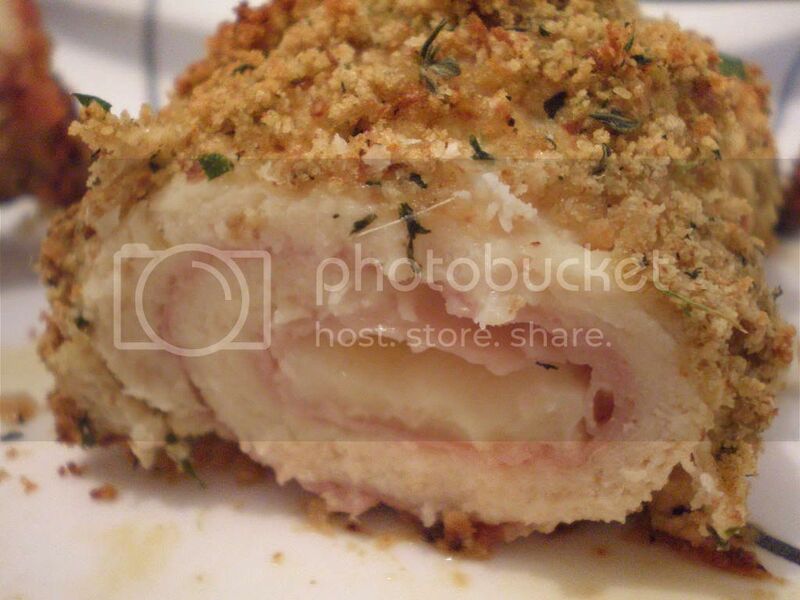 Dip each roll in egg white mixture; dredge in breadcrumb mixture. Place rolls, seam sides down, in a 15 x 10-inch jelly-roll pan coated with cooking spray. Bake at 350° for 30 minutes or until done. Discard wooden picks. Cut each roll into thin slices. Garnish with basil sprigs, if desired. Note: You can substitute 6 (3/4-ounce) slices of 97% fat-free ham, halved, for the prosciutto. Unfortunately, I did not have the required toothpicks, so a bit of my cheese leaked out during the cooking process and they ended up a little bit on the dry side. Overall though, the rolls ended up pretty decent.